LeTourneau Track Trio Competes On Day One Of Carl Knight Multi-Events. 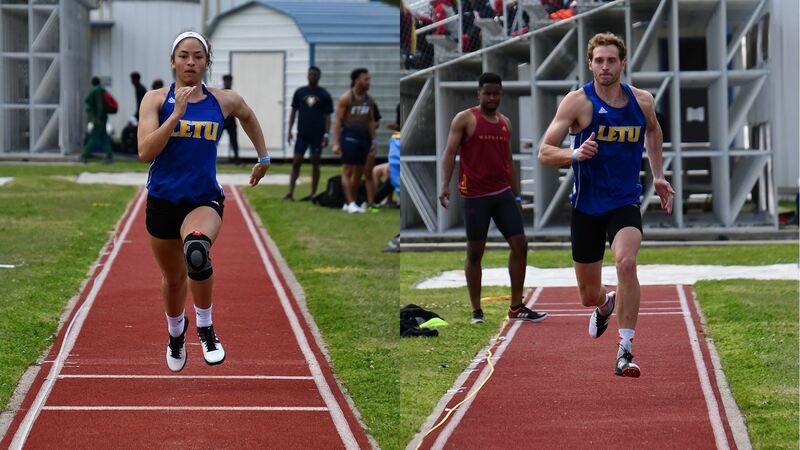 NACOGDOCHES, Texas – Competing in a multi-event challenge for the second consecutive week, the LeTourneau University men’s and women’s track and field team would have a trio of athletes put up a personal-best and record-setting paces. It is in the heptathlon and decathlon on day one of the multi-event portions of the Carl Knight Invitational hosted by Stephen F. Austin University in Nacogdoches, Texas on Thursday, April 4. Competing for the LETU women would be Georgianna Roeder as the freshman would record times of 18.25 in the 100-meter hurdles and 28.03 in the 200 meters with the 200 meters time a new personal-best. Roeder would also match her school record in the high jump with a mark of 1.47 meters (4 ft. – 9.75 in.) and set a school record in the shot put with a throw of 9.56 meters (31 ft. – 4.5 in.) to finish day one with 2,180 points heading into tomorrow. On the men’s side, it would be Collin Jones surpassing last week’s day one tally by scoring 3,027 points with times of 11.43 in the 100 meters and 51.76 in the 400 meters in the only two running events of the day. In the field events, Jones would put up marks of 6.41 meters (21 ft. – 0.5 in.) in the long jump, 1.58 meters (5 ft. – 2.25 in.) in the high jump, and 8.55 meters (28 ft. – 0.75 in.) in the shot put. Arvin Hrushka is also on pace to surpass his personal-best point total in the decathlon. He finished day one with 2,939 points while putting up times of 12.02 in the 100 meters and 53.20 in the 400 meters to go along with marks of 5.81 meters (19 ft. – 0.75 in.) in the long jump, 1.70 meters (5 ft. – 7 in.) in the high jump, and 10.72 meters (35 ft. – 2 in.) in the shot put. Day two of the Carl Knight Invitational will feature the conclusion of the multi-events in the morning before turning things over to the distance carnival on the track to go along with the javelin, pole vault, long jump, and shot put for field events. LeTourneau Women’s Tennis Falls To East Texas Baptist 8-1. 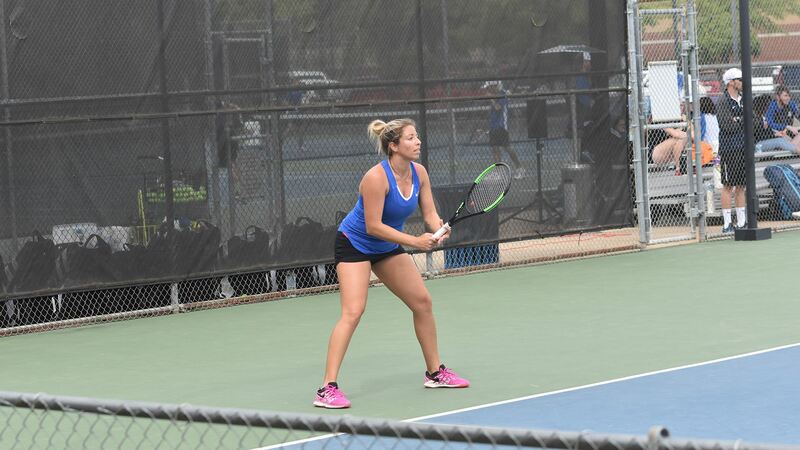 LONGVIEW, Texas- Despite an early victory at number one doubles, the LeTourneau University women’s tennis team would drop an American Southwest Conference home match to East Texas Baptist University by a score of 8-1 on Wednesday, April 3 at the Davis Tennis Courts. The loss drops the YellowJackets to 6-8 on the year, and 1-1 in ASC play while the Tigers move to 10-5 on the season and remain perfect at 2-0 in conference action. Starting off the day for the YellowJackets, Katharine Waldthausen and Gracie Favela won a hard-fought battle at number one doubles by grinding out an 8-6 win. Unable to add another win tally for the LETU women were Terin Murray and Lauren Rockwell at number two doubles (8-0) along with Samantha Trevino and Mimi Samdi at number three doubles (8-1). Hoping to make up some ground in singles play, Waldthausen (number one singles) and Favela (number two singles) both fell by scores of 6-4, 6-4 as East Texas Baptist would grab a 4-1 lead with four matches to play. The game would be clinched by the Tigers with a win at number three singles as Murray dropped a 6-3, 6-3 decision while Rockwell fell at number four singles by scores of 6-1, 6-1. Trevino would pick up a first set victory at number five singles by a score of 6-2, but would wind up falling in three sets 2-6, 6-0, 10-2 before Samdi would end the match with a 6-0, 6-2 defeat at number six singles. LeTourneau is scheduled to return to action on Saturday, April 6 against the University of the Ozarks at 10:00 am in Clarksville, Arkansas. The Eagles will enter the match holding a .500 record on the season at 6-6 and a 1-0 mark in ASC play. If weather forces any changes to the scheduled match date and time, they will be announced on both the LeTourneau University athletics website and social media outlets.